Among the many treasures recently spilled by Apple were three iLife applications for OS X and iOS—iPhoto, iMovie, and GarageBand. 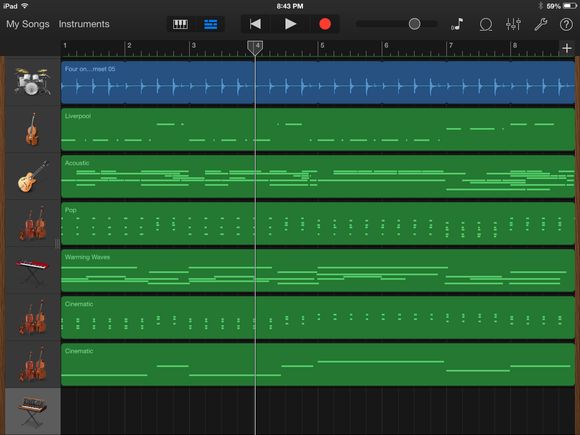 As a musician in my off hours, I was most interested in seeing what GarageBand had to offer. Here are my first impressions of each version. In regard to features, the iOS version of GarageBand has changed very little. Its graphics are “flatter” to conform to iOS 7’s design but as you tap through its menus and instruments you’ll find the same features that were in the original version. It’s not identical, however. Thanks to under-the-hood changes it now supports more tracks. On a compatible iOS device with a 32-bit processor (iPhone 4 or later, iPad 2 or later, and 5th generation iPod touch) the app supports up to 16 tracks versus the 8 tracks you were previously limited to. And with a device that carries a 64-bit processor (iPhone 5s, iPad Air, and iPad mini with retina display), you can create as many as 32 tracks. It also now supports inter-app audio—meaning that you can incorporate into your GarageBand projects instruments or effects from another app. For example, the sound from a third-party virtual synthesizer app. This was possible before only with the use of a third-party app such as Audiobus. The app also supports project sharing via AirDrop for iOS and you can upload your songs to iCloud. You can now also import tracks from your Music library into the Sampler instrument and then modify those tracks with the Sampler’s controls. The latest release of GarageBand for OS X (Mavericks required) gives here and takes there. On the giving side are popular features found in Apple’s professional digital audio workstation application, Logic Pro X. What the company has taken are the tools podcasters depended on. While you can record audio tracks that might be included in a podcast, the dedicated Podcast track, podcast vocal effects, and chapter and embedded links features used in enhanced podcasts are gone. The Magic GarageBand feature is gone too. The ability to import video into a dedicated Movies track remains, however. Similar to the new GarageBand for iOS, if you haven’t previously had a copy of GarageBand on your Mac, the free version you download lacks some extras in the form of additional loops and sounds and access to the GarageBand Lesson Store. You can have those extras with a $5 in-app purchase. Also, in the free version you get just one drummer in the new Drummer track. GarageBand's Drummer track is lifted from Logic Pro X.
Drummer track? Yes. This is a feature that puts a virtual drummer at your disposal. (The free version has just the one rock drummer, Kyle. The in-app purchase provides 14 more who play in different styles.) I’ll go into the nuances of the Drummer track when I review GarageBand, but for now know that it’s easily configurable and allows you to make the drummer’s work more or less complex as well as lets you configure which drums and percussion he favors. Also from Logic are Smart Controls. These are instrument controls that are familiar to musicians. For example, when you choose a vintage B3 organ you’d see drawbars and switches found on these instruments rather than generic sliders and text fields. Choose an electric guitar and you find gain, tone, delay, boost, and reverb knobs. The Smart Controls for GarageBand's B3 Organ instrument. 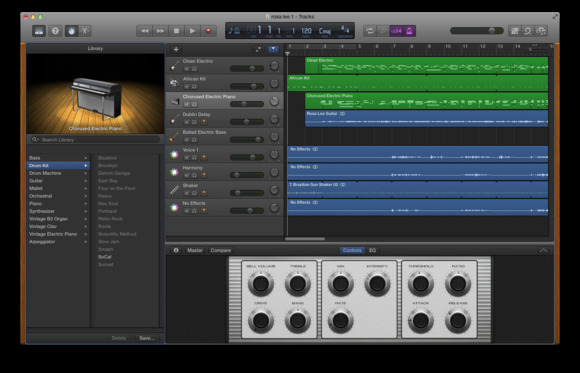 Guitar amps and stompboxes were included in the previous version of GarageBand. Bass players now get amps of their own. These string pluckers will also find that the application’s tuner is more accurate. Other new features include a redesigned interface that bears the dark gray look of Apple’s pro applications, new loops and sounds taken from the Logic library, support for saving songs to iCloud, and the ability to control GarageBand with the free Logic Remote iPad app. The choice to upgrade from an older version of GarageBand is easy. When you upgrade, the old version stays on your Mac and is renamed GarageBand 6.0.5. Should you be unhappy that you can't create podcasts in the newest version or miss Magic GarageBand, you can always use the older version. Updated 10/23/13 2:30PM to include information about Mac OS maintaining the new and old versions of GarageBand.